People have lived in the area of London for at least 5,000 years. With the settlement of Roman Londinium around 2,100 years ago, the dead were buried in large numbers beneath what is now the modern city. The human remains collection at the Natural History Museum contains some of these remains, but many still lie beneath London’s parks and buildings. Here’s what we know about what may be beneath your feet. 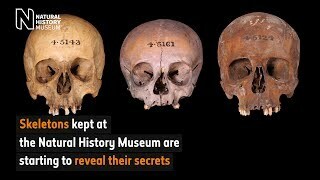 Most of the finds in the Museum’s collection from before Roman times were dredged from the River Thames or are scattered skulls recovered during deep excavations. Not much is known about how or when they were buried. Researchers think several of the skeletons in the Thames are possibly from the Neolithic or Bronze Age (5,000-3,500 years ago). Some remains found in the city could date from the Iron Age (2,500-2,000 years ago). London (or as it was known then, Londinium) was a bustling Roman town. There are several large burial grounds within the modern city. Several of the Roman-era remains in the Museum's collection are believed to come from the fringes of the East London Roman Cemetery, near Aldgate. The Romans had strict rules stating that they could not take place within the boundaries of any settlement throughout the Empire. However, there were a large range of different burial types, the most common being cremation and burial of people lying on their backs. There is also evidence of wooden coffins, from the abundance of nails found in many graves. Perhaps as many as 100,000 people were buried here during Roman occupation, but this ended abruptly at the start of the fifth century as the Empire collapsed and Londinium was abandoned. The remains in the Museum's medieval collection are surprisingly sparse - until you consider that burial at the time was sometimes only a temporary measure. People were often buried without coffins and left to decompose for a few years, after which graves could be opened and the bones removed. The bones were then placed in a charnel house, a vault for storing human skeletons. The gravesite was then reused. This is still a common practice where space is at a premium, such as on the rocky Greek islands. Predominantly Catholic beliefs of the time led to the practice of the living helping the dead reach paradise. Prayers could be bought from the Church in order to shorten dead relatives' time in purgatory, a holding place for souls not yet worthy of heaven. This was soon to change. When Henry VIII decided to divorce his first wife, England's split from the Catholic Church began. Henry became the head of the Church of England and beliefs shifted towards Protestantism, a change that filtered down to burial practices. Now, the dead were expected to do their own work in the afterlife, and their bodies were revered and memorialised. This led to more burials with coffins, gravestones and monuments. While this was the case most of the time, during the Great Plague of 1665-6 more than 15% of London's population was wiped out - some 100,000 people. With cemeteries unable to cope, a series of plague pits were dug on the outskirts of the city. A handful of skulls in the Museum’s collection probably originate from the 'pest fields', a plague pit at Gower's Walk near Aldgate East. However, the trend of more permanent burial, much of it within city limits, meant cemeteries began to fill up. By the 1850s, London's inner-city cemeteries were in an appalling state. This was typified by the Green Ground, a site near Holborn now partly occupied by the London School of Economics. There was a dense population around the site that had to breathe in the 'odour of the dead', supposedly causing illness. Gravediggers themselves could contract typhus and smallpox from handling diseased corpses. The overcrowding of the dead meant relatively fresh graves were broken into while new ones were being dug, and corpses were dismembered in order to make room for more. The site was also subject to body snatchers, who sold the corpses on the black market as medical cadavers. The foul state of burial grounds was highlighted by some public health advocates, but the government did not take any action until the cholera epidemic of 1848 that killed 60,000 people in the UK. The ills of the city had to be fixed. The government passed a series of Burial Acts in the early 1850s that prohibited the majority of burials within the city limits (except for royalty). Burial grounds began to close, and many remains were relocated to growing private grounds that had been established outside the city. These sites, termed the Magnificent Seven, were established from 1832 and enjoyed great popularity following the Burial Acts. They include sites now well within the modern city, such as Brompton Cemetery and Tower Hamlets Cemetery Park. Not all closed grounds had their bodies removed. Some deeper burials were simply left, and the grounds built upon - modern construction still turns up these remains. However, many people were against building over the grounds, instead advocating for them to be converted to public parks. The government eventually agreed - meaning that green spaces in London today are often hiding a grisly past. The first mass burials in London arose during the occupation of the Romans, who used coffins and cremation, and made sure burials were outside the city limits. All these principles were abandoned when they left, and the state of death, and nearby life, deteriorated. However, coffins came back into fashion after the medieval period, and the Burial Acts in the 1850s pushed burial grounds away from centres of population. Finally, cremation was made legal in 1885, and today more than 75% of burials in the UK are cremations. 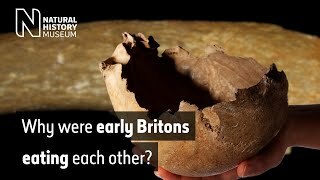 Human remains from prehistoric to Victorian times reveal how people lived and died in the city.